Back in the 1940's, a couple years before electricity made it up their Appalachian valley, my grandfather worked all for the highway department, then walked back up the side of the mountain to a two-room sharecropper's cabin that held my grandmother and five kids, packed a second lunch, and walked back down the mountain, to his own land, where he worked until midnight building a home of his own. That home would be two-stories, with six rooms, heated with a large wood stove, and have no indoor plumbing or running water until the 1970s. 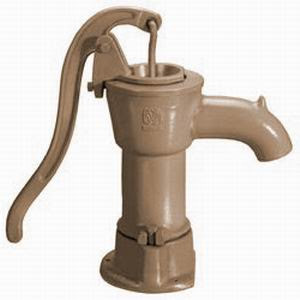 Until I was fourteen, the only way to have water in the house was to manually draw it by hand, using a pump similar to the one pictured above. The pump pulled water out of a concrete cistern that was buried next to the house. Water collected into it from rainfall, as well as from a deep spring that originated from high up on the mountainside. Never in my life have I tasted water as wonderful as the water from that spring. 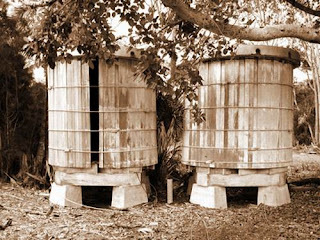 These are old wooden cisterns, probably from the 1940s, but built down on the Mississippi gulf front, where the water table is too high to bury much of anything. 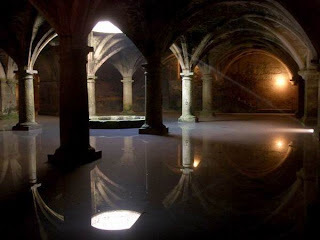 And these are the water cisterns of El Jadida in Morocco, built by the Portuguese. They collect hundreds of thousands of gallons of water, and date back to the 1500's. The word cistern comes from the Middle English root cisterne, derived from the Latin cisterna, which is descended from cista, box, from the Greek word kistê meaning basket. So we have boxes and baskets for water. 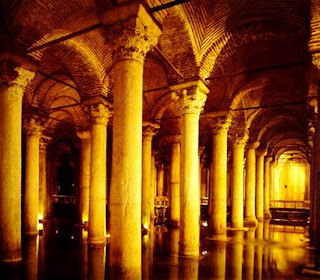 But this one is the one I'd like under my house -the ultimate "rain barrel": the Basilica Cistern, built during Roman times, of Corinthian marble, far below the streets of Istanbul. When the Ottoman Turks captured the city, this beautiful place was forgotten until modern-day Turkish citizens reported catching fish through holes in their basements. Today huge carp still swim here, undisturbed. AWESOME!!!! How can we be so blindy stupid and foolish in our modern society to have rejected these ways? It truly boggles the mind. Wow.